Many College of Business students have full time jobs and life obligations outside the classroom. For student athletes, the commitment to a collegiate team demands significant time and energy; it is a full time job. 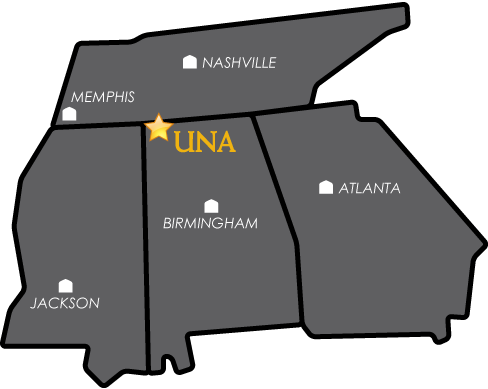 At UNA, academics are the priority, and our faculty work closely with students and coaches to ensure our athletes are succeeding on both the field and in the classroom. The College of Business would like to honor all of our Seniors who are participating in Fall Sports at UNA. Danielle Scanlon is also on the UNA soccer team. She is from London, England and will graduate in May with a degree in Economics and a minor in Entrepreneurship. “The College of Business respects our responsibilities and our busy schedules as student-athletes,” Danielle said. “Together the athletic department and COB have allowed me to succeed both on the field and in the classroom. Online classes have been very useful, particularly when we are traveling in season and are consequently away from school. I know without a doubt that the support I have received from the Faculty and Staff in the COB has helped me to succeed!” Danielle has started 14 games and has scored nine points for the Lions. The College of Business congratulates these and all of our Senior Student-Athletes!